The wide variation in size (and coat colour) of the African Leopard most likely reflects natural phenotypic variation in response to the diverse range of habitats and environmental conditions in which this species is found across its range. There is some speculation that this variation reflects speciation, specifically that the African Leopard comprises a number of sub-species. However more research is needed to validate this. Historic: Most of sub-Saharan Africa in all habitats with annual rainfall above 50 mm (2.0 in) and in drier areas where there is available water and cover. Current: The African Leopard has vanished from almost 40% of its historic range and remains patchily distributed within its current extent. The most marked range depletion has been in the Sahel belt, Nigeria and South Africa and it is now rare throughout much of West Africa. In North Africa, a tiny relict population persists in the Atlas Mountains of Morocco and is likely to be extinct in Egyptc. In South Africa, leopard populations are smaller and more fragmented then previously believed. Densities vary with habitat, prey availability, and degree of threat, from less than one per 100 km² to over 30 per 100 km², with highest densities obtained in protected East and southern African mesic woodland savannasc. The African Leopard has an extremely diverse diet. More than 90 species have been recorded in the diet, ranging from arthropods, reptiles, small birds and small-to medium-sized mammals, and occasionally mammals as large as adult male Eland (Tragelaphus oryx)b,d,e,f. Hunting activity usually focuses on locally abundant medium-sized ungulate species in the 20-80 kg range, while opportunistically taking other prey. Size of prey is related to the age of the leopard and relative abundance of different sized prey species. For example, smaller prey tends to be taken by sub-adult individuals and when larger prey is less available. This flexible diet allows the leopard to successfully compete with larger carnivores. In addition, by caching large prey in trees the leopard is able to protect its prey from larger predatorsb. IUCN Red Data List Near Threatened* - NT (they may soon qualify for the Vulnerable status due to: habitat loss and fragmentation; they are becoming increasingly rare outside protected areas; and the population is decreasing). CITES Appendix I (“Threatened with extinction and is or may be affected by trade”). Legal international traffic: limited largely to exports of skins and hunting trophies under a CITES Appendix I quota system by 13 African countries. National legislation: includes protected across its range, although killing of “problem” animals, either by landowners or government authorities, generally permitted. Hunting prohibited or restricted to “problem/ dangerous” animals: Angola, Benin, Burkina Faso, Cameroon, Congo, Djibouti, Equatorial Guinea, Gabon, Ghana, Guinea Bissau, Ivory Coast, Liberia, Mali, Mauritania, Niger, Nigeria, Rwanda, Senegal, Sierra Leone, Somalia, Sudan, Togo, Uganda, Zaire. No information: Burundi, Chad, Guinea. *NB. The African Leopard is not distinguished on the IUCN Red List of threatened species. The IUCN Status is therefore a composite for all subspecies of P. pardus some of which are critically endangered (e.g. P.p. nimr, P.p. orientalis). In general, P.p. pardus is probably the least endangered of the subspecies, but it is also possibly the most heavily persecuted and rapidly declining. Wild: There are no reliable continent-wide estimates of population size in Africac. The population of leopards varies over its range. While still numerous and considered thriving in some marginal habitats from which other big cats have disappeared in many parts of sub-Saharan Africa, in North Africa leopards are on the verge of extinction. In South Africa, best guess estimates for the population are between 2185 – 6780 individualsd. Habitat destruction for agriculture and development. - Poisoning of carcasses by livestock owners to target large carnivores is an increasing threatb, particularly in semi- desert areas, where scarce resources often result in conflict with nomadic farmers and their livestockc. - Elimination of natural prey species is resulting in more conflict with humanse. For example, in intact rainforest, competition with human hunters for prey (bush meat) denudes forests of prey and may drive localised extinctionsc. - The leopard is one of the ‘Big Five’, meaning that along with the Lion (Panthera leo), the African Elephant (Loxodonata africana), the African Buffalo (Syncerus caffer) and rhinoceros (Diceros sp.) it is one of the most highly prized targets of sport huntersd. - The impact of trophy hunting on populations is unclear, but may have impacts at the demographic and population level, especially when females are shot. In Tanzania, which allows only males to be hunted, females comprised 28.6% of 77 trophies shot between 1995 and 1998c. The African Leopard occurs in numerous protected areas across Africab, and growing wildlife tourism throughout this species’ range may make a significant contribution to its survivald. 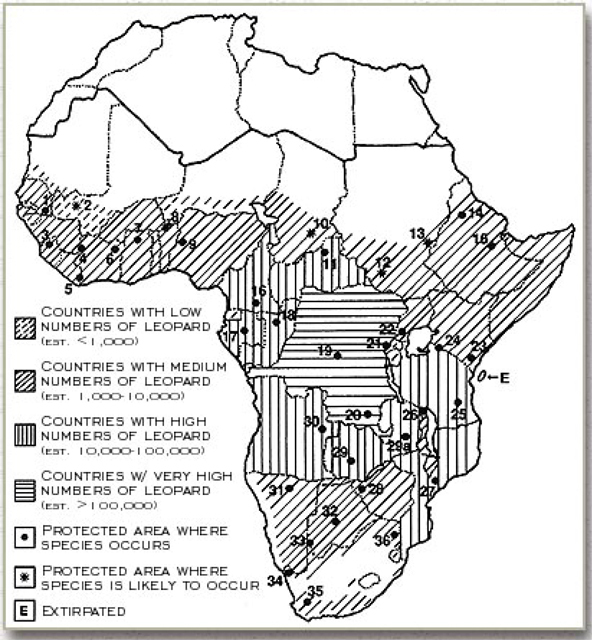 The majority of the population occurs outside of protected areas, necessitating a need for improved conflict mitigation measures (including livestock management, conflict resolution)c.
d Friedmann, Y. and Traylor-Holzer, K. (2008). Leopard (Panthera pardus) Case Study. WG 5 – Mammals, Case Study 4 Panthera pardus. Country – SOUTH AFRICA. NDF Workshop Case Studies, Mexico. e Nowak, R.M. (1991). Walker’s Mammals of the World. The Johns Hopkins University Press, Baltimore and London.